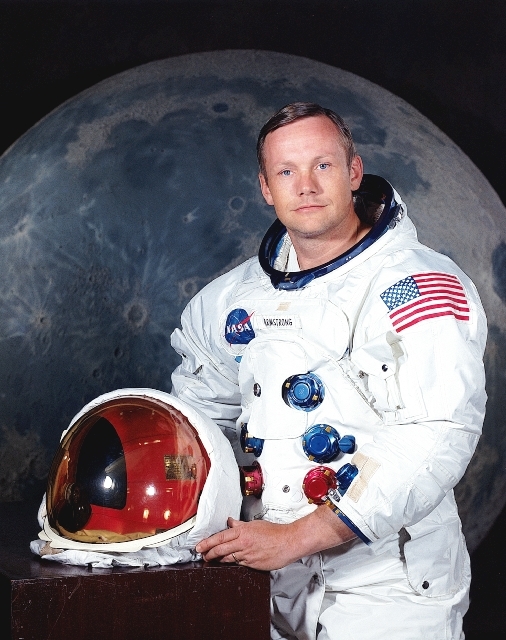 Voir : Neil Armstrong en photos . Naissance : 5 août 1930, à Wapakoneta, Ohio, États-Unis. Antécédent : Pilote d'essais (notamment sur X-15). Sélection : 17 septembre 1962: deuxième détachement d'astronautes de la NASA. Total : 8 j. 14 h. 00 min. 1) Apollo 11 20-21 jul 69 2 h. 32 min. Premier homme sur la Lune. Décès : 24 août 2012 (des suites de complications à la suite d'une chirurgie cardiaque). Remarques : Premier homme à avoir marché sur la Lune. 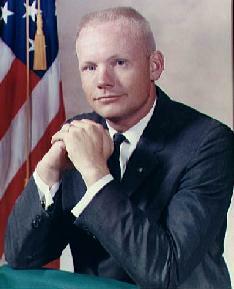 Neil Armstrong was born in Wapakoneta, Ohio in 1930. After flying 78 missions as a U.S. Navy pilot in the Korean War, he joined the NACA research agency (which became NASA in 1958) and made four flights in the X-1B rocket plane in 1957-58. In April 1962, while a NASA civilian test pilot at the Flight Research Center at Edwards, Armstrong flew the X-15-3 rocketplane into the Earth's mesosphere, reaching 55 and 63 km altitude. He then joined the NASA astronaut office in Houston and, after serving as backup commander for Gemini 5, he flew in space in March 1966 as commander of Gemini 8 which saw the first orbital docking and the first emergency orbital spin recovery and return to Earth. After two more backup slots on Gemini 11 and Apollo 8, his second and last spaceflight was as commander of Apollo 11. On 20 July 1969, Armstrong and Aldrin became the first humans to land on another world, as Armstrong brought Eagle to a manual landing with only 20 seconds of fuel left. He then was the first human to walk on the lunar surface. In 1971 he left NASA and returned to Ohio where he taught aeronautics for several years. On 24 August 2012, Neil Armstrong died of complications from heart surgery in Columbus, Ohio, a few weeks after his 82nd birthday.